in the current issue of Science, neuroscientist Larry Young and his co-author Catherine E. Barrett say oxytocin is an exciting target for improving social function. Larry Young, PhD, says 'yes'. 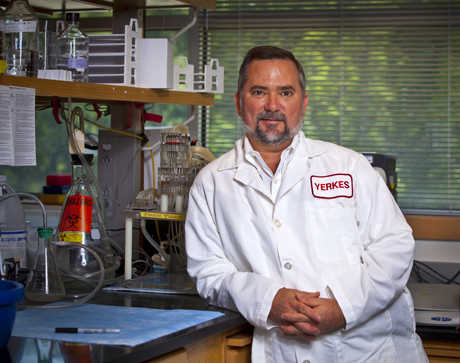 Young is division chief of Behavioral Neuroscience and Psychiatric Disorders at the Yerkes National Primate Research Center, William P. Timmie Professor in the Emory School of Medicine Department of Psychiatry and Behavioral Sciences, and director of the Center for Translational Neuroscience at Emory. In a "Perspective" in the current issue of Science, Young and his co-author Catherine E. Barrett, a postdoctoral researcher at Yerkes, say oxytocin is an exciting target for improving social function. Though research into oxytocin’s potential therapeutic applications is still in the early stages, the researchers recommend the path moving forward focus on parallel animal and human studies to detail the conserved effects of oxytocin on brain communication in response to social stimuli and say animal research is critical for understanding precise mechanisms of oxytocin’s actions. "The Love Drug" appeared in The Huffington Post Feb. 13. The Associated Press released a story about Young's research that has appeared in outlets worldwide.